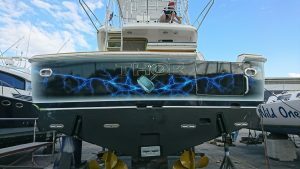 Looking to transform your new boat or just wanting to make your old boat look new again, Signations are the experts in marine vinyl wrapping and finishing. Our durable cost effective designs will give your boat that impact you are searching for. Vinyl wraps are a great alternative to repainting, will last longer than paint and vinyl wraps require minimal maintenance. Our highly qualified team at Signsations use only the best quality vinyl from 3M and Avery Dennison and here at Signsations we take pride and care in our work.